Take a nostalgic trip with Emily through defining eras of music. 'Goin' Back - Female Icons of the 1960s' is a glitzy nod to all the fabulous divas of the decade. 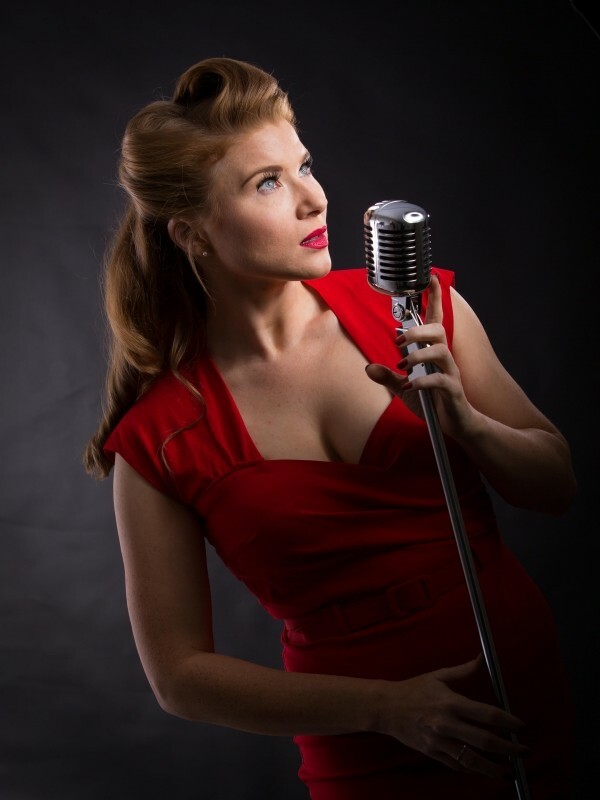 Emily also performs a Carpenters Tribute, A swingin' 1940s show & An evening of Glittering Gatsby. Dusty Springfield, Tina Turner, Cilla Black, Diana Ross, Ella Fitzgerald, Karen Carpenter, Edith Piaf, Gracie Fields, Vera Lynn, the Andrews Sisters ....the list goes on! Come and celebrate some of this wonderful music with Emily as she takes a trip through the fabulous Female Icons of Music. Featuring hits such as 'Alfie', 'River Deep', 'You Don't Have to Say You Love Me', the show 'Goin' Back - Female Icons of the 1960s' covers classic tunes of the decade as well as re-imagining some well loved numbers. A fresh and vibrant mix of nostalgia and imagination makes 'Goin' Back' a truly uniqu ... e show - not to be missed! 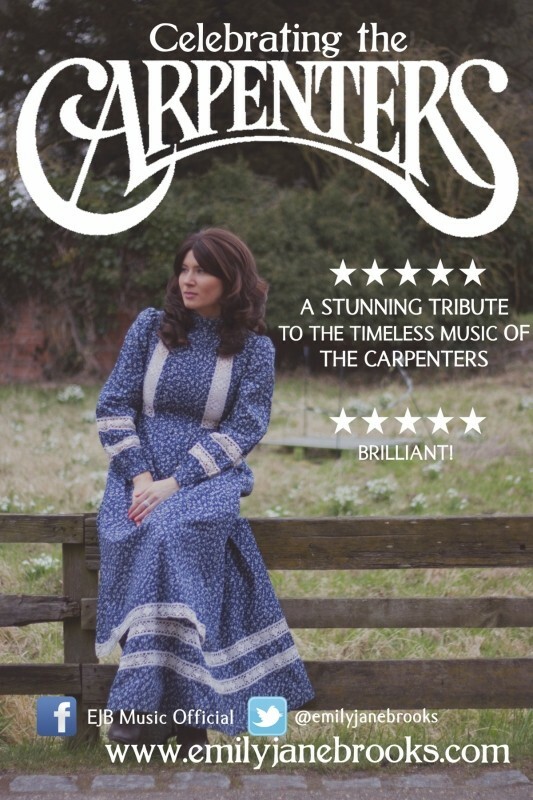 Celebrating the Carpenters covers the warm and evocative repertoire of the Carpenters and emulates the dulcet tones of the incredible Karen Carpenter. 'Now is the Hour' features a whole host of numbers from the 1940s and 50s to capture the mood of the nation. 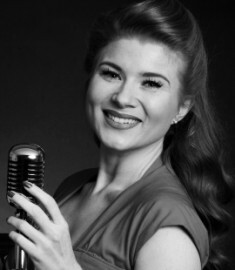 A trip down memory lane through the music of Vera Lynn, Gracie Fields to the Andrews Sisters, Doris Day and many more. 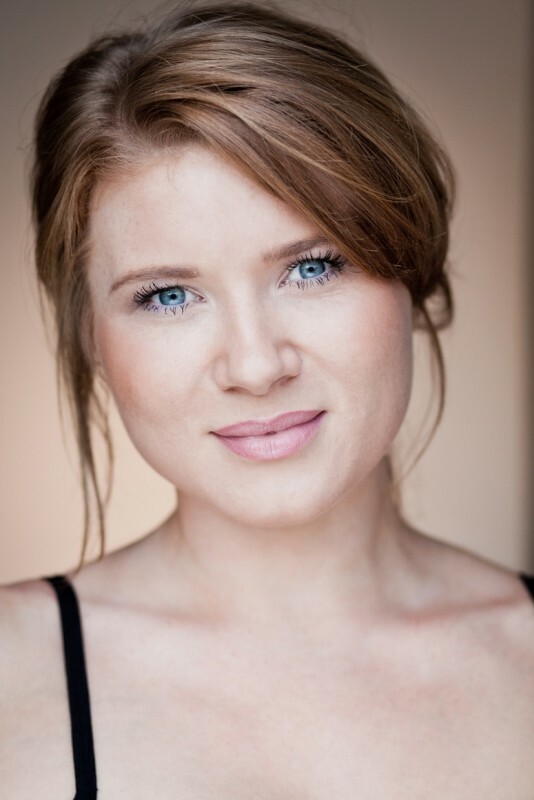 Emily was born and raised in Coventry and read Theatre and Performance Studies at the University of Warwick. After winning a BBC Performing Arts Fund bursary she went on to study Music Theatre at the Central School of Speech and Drama. She continues to be grateful to the BBC for all their help and support. Since graduating in 2008 she has travelled the world touring in productions and working at sea. Highlights for Emily have been touring Italy in Oscar Wilde's The Canterville Ghost, entertaining a crowd of thousands in Don Giovanni: The Gay Don in Trafalgar Square for London Pride, backing Th ... e Feeling and Elio Pace in concert and performing internationally with award-winning Polish theatre company Teatr Biuro Podrozy. Emily regularly tours the UK with Vintage Groups The Bombshell Belles and The D-Day Darlings, who are supported by the Royal British Legion and Dame Vera Lynn. She has also performed onboard the world's most famous ocean liners for Cunard; the illustrious Queen Elizabeth and Cunard's flagship the Queen Mary 2. 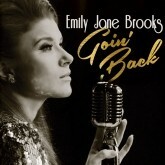 In May 2014 Emily launched her first studio album and one woman show entitled ‘Goin’ Back - Female Icons of the 1960s’.The show is a glitzy nod to all the female music artists of the decade featuring the hits of Dusty Springfield, Cilla Black, Shirley Bassey, Tina Turner, Diana Ross and many more. The album, which features original arrangements of anthemic 1960s hits, is available on iTunes, Rdio, Amazon MP3 & Spotify and at the online Auburn Jam Studio shop. 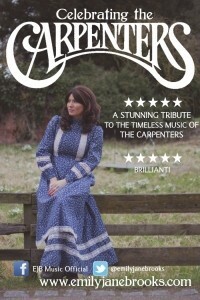 Emily performs a tribute show to The Carpenters - emulating the vocal quality of Karen Carpenter. 'Yesterday Once More' features all the well loved Carpenters classics. Emily recently toured the UK with smash hit concert 'The Knights of Music' hosted by Phillip Schofield. A tour she will embark upon again in April 2017. On behalf of everyone from Leycester House Care Home we would like to Thank you for performing for our lovely residents and we look forward to booking you again very soon! “Pure class. Gorgeous. A Star is Born!” Ricky Brown ‘Dr Showbiz’ BBC Radio Northampton. Previous Clients include: Cunard, Rotary International, TNT, Labour UK, Leycester House, Boston Lodge, Nicholas Chamberlain Trust, Mitchell & Butler. Cruise Ships Wedding Reception Entertainment Birthday Party Entertainment Private Parties Corporate Events Cocktail Receptions Product Launches Trade Shows Christmas Party Events Gala Dinners After Dinner Entertainment. Equity Member, Full Clean Driving Licence.